Only looking for around 750 rear wheel. Doable? The cost of Q16 is crazy. fuel is relative to boost, not power level. YES VERY!! Hey chuck PM me!!! thanks for the replies guys. We will see in a few weeks. nope, otherwise you wouldn't be seeing people pushing 700+ to the wheels on pump gas now. smaller turbos push 18 psi on pump gas at their threshold of popping the motor and can only push 300 to the wheels, now you have baby chipper turbos that are efficient pushing the same boost and threshold pushing 600 to the wheels at the same level. it is mainly reliant on the turbo and engine as to where the fuel will ignite without spark. i haven't tested e85 to any extent to know exactly how much PSI it can take but i would have to say it is good to ~28psi, variance depends on your setup and internal temps and can be raised with water injection to further cool the combustion process and add relative CR. e85 has an octane rating of about 95, 91 octane in a rotary application generally causes detonation around 18psi and 87 octane detonates ~9psi, given that table you can come up with a general figure of approximately 5psi for 2 octane points. so in short, if using a large enough turbo, even 1000WHP isn't unfeasible but the power band would be short and unusable until turbo technology produces a turbo mapped that can be that efficient(but turbos are becoming about as efficient as they ever will be, mainly due to drag). most old school rotary drag racers have been using methanol for years and even pre-spooling their massive turbos with nitrous and crude ignition cuts and using air shifter trannies to reduce the lag created by the air dumped between shifts when lifting the throttle(giving them a boost at getting back into their efficiency range). 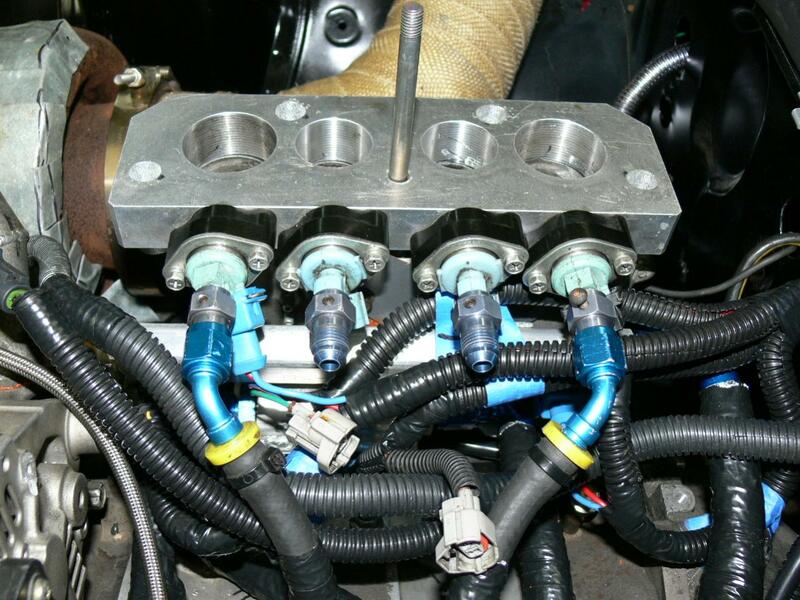 Hey sleeper what size injectors and how many are you running? Four 1680 and two 1000. Have two more 1000 installed if needed. I bought some 1800 but did a flow comparison with some known 1680s and they flowed the same. i did specifically cite in rotary applications. i do not tune piston engines nor have i done testing to see what their natural threshold of detonation versus boost is, which also will vary more due to cylinder head/piston shape and internal hot spots. now that said, piston engines can push more boost on lesser octane fuel before it auto ignites. also note that piston engines generally gain less horsepower per psi of boost being added, until you get into much larger displacement engines(larger than the typical 2.6L we are supposed to be comparing to). you can take it or leave it, i really don't care either way. methanol does have better cooling properties than fossil fuels so it may well have a higher threshold, i just tossed out a figure as a guess and didn't mean it was 100% accurate. if you think it is safe to push a turbo rotary more than a psi or 2 past 18 on 91 octane to prove me wrong on my starting point basis, feel free. You will need more injector most likely. I ran 4x1680 and ran out of fuel at 30psi on E85, Injector duty cycles were over 95%. I then upgraded to 2x1000 and 4x1680 which I currently have now. I will be upgrading to 6x1680 in the very near future. Plan as of right now, run the four 1600 and two 1000 with a base fuel pressure of 50psi. Put the thing on the dyno and see what 100%dc will get me. Then take it to the track and see what the car will run. If happy with the track results I'll leave everything alone and have fun, if not, the other two 1000cc injectors will have to go to work and up the boost to run my goal at the track. I am hoping that the weldon fuel pump and -10 fuel line with flow enough to keep the DC number down. Get ahold of Injector Dynamics. Use their ID2000 injectors. 4 of those will get you to 600 RWHP on E85 and you will still be able to idle. Add another one and you should be able to hit the 700 RWHP mark. As far as fuel pumps go, go with 2 Bosch 044's. E85 is 105 octane, but it's cooling properties make it very rotary friendly. It is really hard to get any knock with E85. I have run 13:1 AFR's (gas) @ 25 PSI and not even a hint of detonation. I add a little meth injection when it gets above 25 PSI just for added protection. Wow, 600rwhp on 8000cc of fuel. Thats 1000$ and your saying to add more of them to reach 750. Already spent my money on the weldon, going to try it. we will see how it works out. Sounds like you have plenty of injector to do it. Don't know about the pump. changed the fuel set up. Now running six 1600cc injectors. Two primary and four secondary. Still have two 1000s as back up. will see where this goes in a week or so. sleeper7, do you have any pics of yer' fuel setup? four in the stock location and using the spacer in between the LIM and UIM. No problem, just wanted to make sure im understanding you and not take what you say the wrong way. Im still new to the e85 solution and want to keep learning more about the closer i am to buying a single. I know you need the extra fuel, but that is probably not an optimized solution. The angle of the injectors will just be wetting the walls of the runners. Although, the 1680's are really terrible for atomization in any matter. The goal is to maximize atomization so that the fuel not only creates a more homogeneous mixture, but also more effectively pulls heat out of the intake charge. I understand there may be some other constraints that can limit placement of injectors, but if possible I would avoid mounting in this manner. Also, are those two injectors in the primary runners going to be used? I know you're still in the build process, but I noticed they weren't plumbed yet. I'm sure you know this, but those reading that don't, the injectors need to either see fuel pressure or be sealed off on top. Otherwise it will create a boost leak as manifold pressure only needs to overcome the spring pressure holding the pintle shut (not very much..) to open the pintle and leak. Edit: I noticed you were using a flow-through style pump. I'm glad you chose a weldon, but are you aware that their flow-through pumps are sold as being not compatible with alcohol/ethanol fuels? I'll cap the two in the middle. Used the spacer before with good results but never with bosch 1600. always ND 1000s. Maybe I will trash the 1600 and put the 1000s back in and run all four 1000s with the two 1600 as secondary. two 1600 for primary in stock location. two 1600 secondary in stock location and four 1000s in the spacer. Then for sure it will have enough injectors. Then the pump will be the limiting factor. But the cell has another -8 outlet for another pump and I do have a welbro 255 laying around. thanks for the heads up on the pump. Not sure how I missed that about the pump but it clearly states that in the info on the pump.